Please keep in mind that this activity is about playing and experimenting. Precision, exactness of shape, perspective and lighting?…these concepts are for future activities. Disclaimer: This is my approach and lacking any formal training. I learned by playing with the pencils versus taking any classes. I would recommend that if you want to pursue this medium further, search out classes, books and/or other web sites on this topic. Of course you may find that you learn best by just playing and experimenting with them. 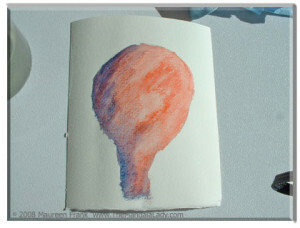 2 watercolor brushes: I used a small round brush, and a 1/2″ flat brush (you can use these or whatever watercolor brushes you have available to you). 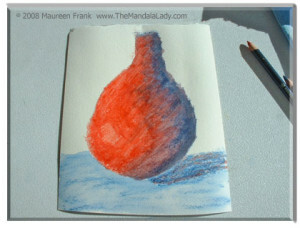 2 watercolor pencils: red and blue (I used Stabilo Aquatico brand…but almost any brand of watercolor pencil will do). 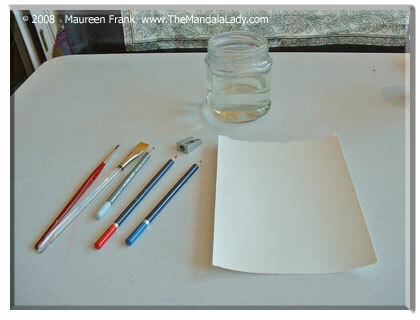 1 light gray watercolor pencil to draw out the design. You can use a regular pencil; the lines you draw will be visible as you paint. 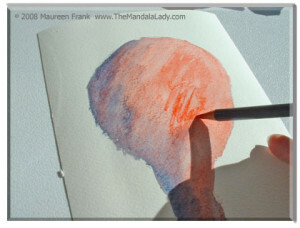 With the watercolor pencil, the gray will disappear into the painting. 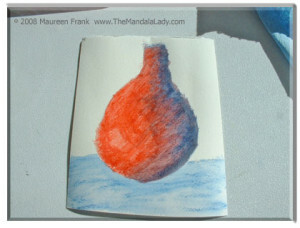 As an added activity do this painting twice, once with a gray watercolor pencil and once with a regular pencil. See which one you like better. 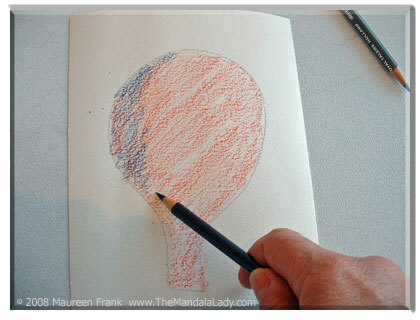 Use your gray w/c pencil (or regular pencil) to draw out this loosely drawn balloon shape. 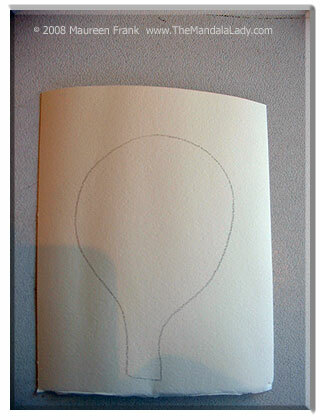 Again, forget about precision…keeping it loosely drawn, makes it more interesting. Using the side tip of the red w/c pencil, roughly color in the balloon shape. Whatever angle you color, be consistent throughout. I colored on a right angle. You’re welcome to color straight up & down, on a left angle, or horizontally. Color with the blue pencil along the right side of the balloon, following the shape of the balloon. What color do you get when you mix blue and red? Purple! The balloon with the blue added. 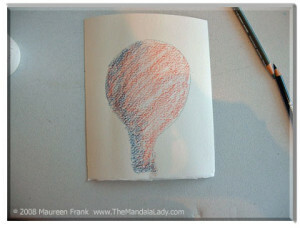 Using the blue in this way makes the balloon look more 3-dimensional instead of flat. 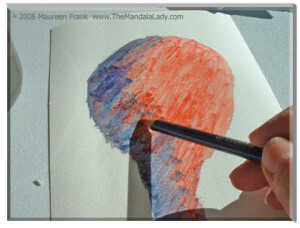 Take the round brush, dip it in water, and brush over the red section, brushing at the same angle as the original coloring and along the outside edge of the drawing. 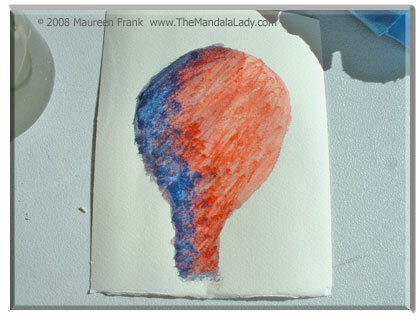 Mid-way with brushing through red section. As needed, wet your brush to help with the spreading of color. 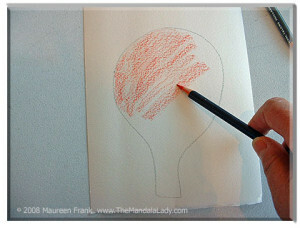 Now color the red as you did when the pencil was dry, continuing on the same angle as you originally colored. 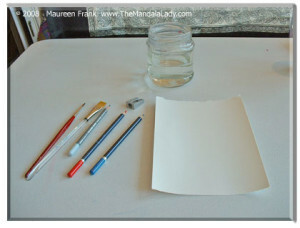 It will take several dippings back and forth between the water and the paper. You’ll see that the color will go on darker, with some lines. 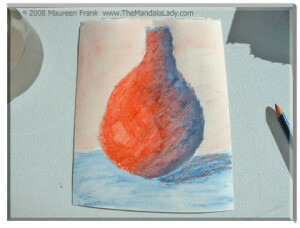 This will give the painting some texture. 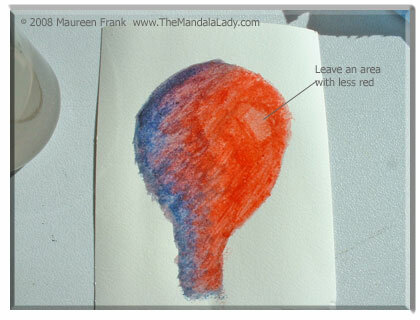 Add more red, leave a small curved rectangular area with less red. 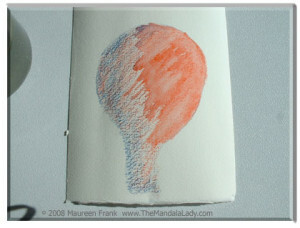 This will act as a reflection and give the balloon more of a 3-dimensional shape. Now here’s the surprise…turn the painting upside down. 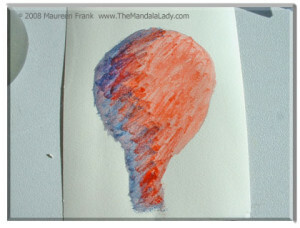 My original intent for this painting was to create a balloon. On a whim, when I got to this point, I decided to turn the painting upside down. I found this to be more interesting…now it looks more like a vase. The vase feels link it needs a background. The general rule of thumb when painting is to paint the background first and then the subject. 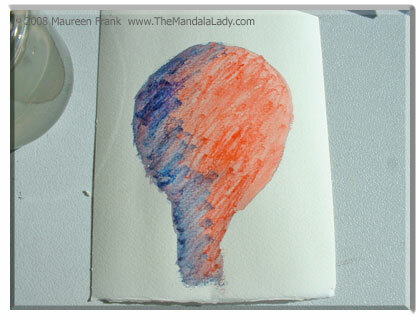 Since my approach to this painting was very loosely based, we’re doing it a little backwards…and that’s ok. 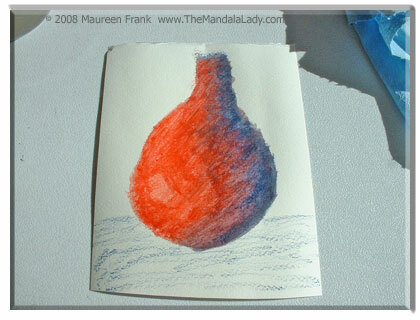 Here I took the blue pencil, and very loosely colored in some blue in the bottom third of the paper. 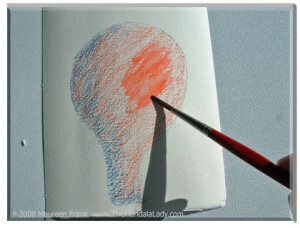 Using the flat w/c brush, wet the brush and spread the color out along the paper. By putting only a little blue on the paper from step 18, the blue becomes a light blue when water is added to it. To give the painting more depth, create a shadow area to the side of the vase. Use a wet blue pencil to color in the shadow. 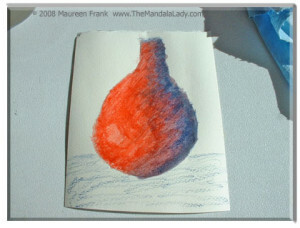 Make it curved so that it resembles the shape of the vase. Then add some wet red pencil to the shadow. 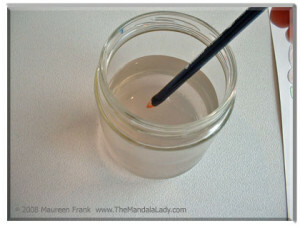 You can smooth it out if necessary with a brush. You can play around with the shadow placement. Just know that the light is coming from the right, so the shadow has to be somewhere on the right. I’ll be discussing shadows in another activity. To finish the background, lightly color in some red (dry pencil) in the upper 2/3rds of the paper. 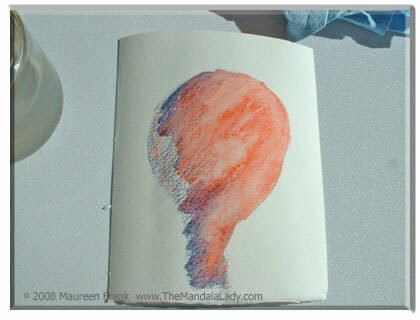 Use the flat w/c brush, wet the brush and spread the color out along the paper. And we’re done! The way I placed the shadow on the blue surface, makes the vase look like it’s floating. Play around with the shadow placement and notice what happens to the vase. And look at how many colors appear in this painting…it still blows me away with what you can create with using only two colors.! Whatever you do, just have fun with it & experiment! 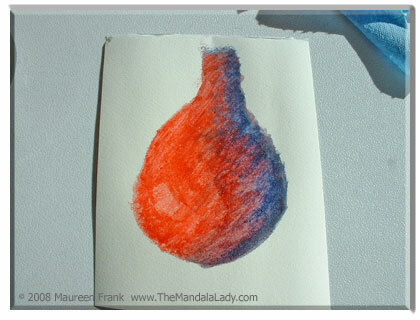 I’ve never used watercolor pencils. I think I’ll by me a set. 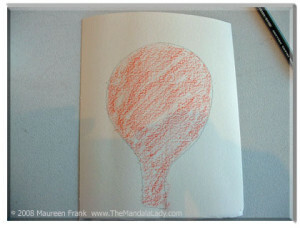 Can you recommend a good sketchbook (not the moleskin) that would hold up to light washes? Your best bet is to buy a watercolor paper sketchbook. They usually come in 90lb or 140b weight paper. Thank you for the unique style of playing with 2 colors in such a simplistic approach to painting with watercolors. You seem to have an honest, open style that encourages students, rather than a critical precise expectation. It was very rewarding and refreshing to learn while offering other optiions for practice. What do you think about experimenting with this approach as an underpainting with pastels suspended on the surface? Thank you for your inspiring essence. many apologies for the extreme delay in replying to your question…I just today discovered your comment. 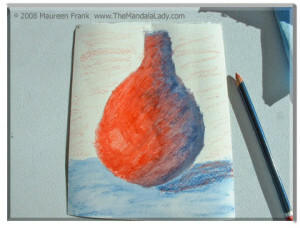 Absolutely…watercolors work great an underpainting for pastels as well as other mediums…color pencils, markers, etc.